If you compare what your grandparents considered to be a decent appearance, a normal flat or a sufficient amount of food in the pantry to your own ideas, you will probably notice many differences. Some may even have been articulated already in the form of amazement; or, if you are less lucky, in the form of reproachful remarks that you don’t dress prettily enough, that you set your standards too high (or too low), or that you don’t plan long-term enough. Some of these differences are due to the fact that your grandparents are older than you and they are in a different stage of their life, often referred to as age effect and life-cycle effect, respectively. 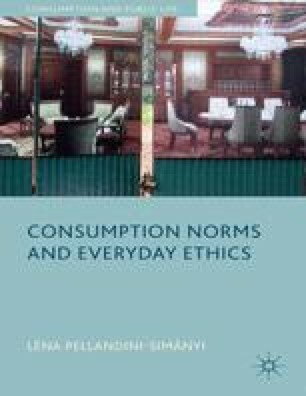 Others, in turn, are due to the changes of consumption norms over time, from one generation to the other. This can be termed as the generational or cohort effect, meaning that your grandparents grew up in different times, and were therefore exposed to different social, economic and cultural influences (Mannheim, 1972). If we compare our own consumption norms to those held a few hundred years ago, these changes become even more striking. What was considered a normal standard of hygiene would be considered utterly unacceptable today, and in most countries it would be unimaginable now if sumptuary laws told us not to consume a given good because we are of a certain social class or gender.